Are you looking for more information about the installation of a green roof, sedum roof or roof garden? Then you have come to the right place. With over 300 successfully landscaped projects and over a 100 green roofs in maintenance, we are the green roof experts. A basic green roof has a nutrient-poor substrate layer of 5 cm. The vegetation consists mainly of succulent plants, also known as sedum. These can be planted individually or installed as pre-grown mats. The advantage of individual implant is that it delivers a wider variety of plants. The advantage of pre-grown mats is an immediate, attractive result. Starting from the bottom, the following layers are applied: root barrier, protection mat, drainage layer, filter fabric, substrate and finally the plants. The green roof is enclosed by an edging profile. A basic green roof has a saturated weight of 90 kg/m2. A lightweight green roof with a saturated weight of 60kg/m2 is possible if necessary. A biodiverse green roof comes with an average substrate of 8 cm, resulting in a sloping landscape with valleys of succulents and hilltops of herbs and grasses. 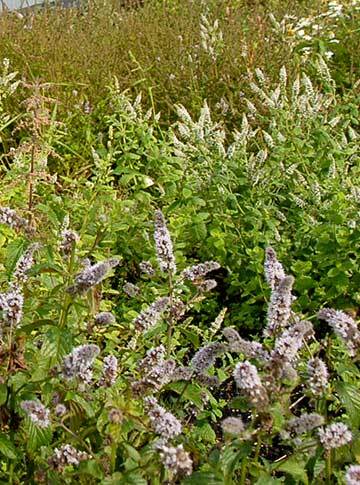 In comparison to the basic green roof, a much richer biodiversity is created. This option is only available if the maximum load bearing capacity of a roof exceeds 120kg/m2. 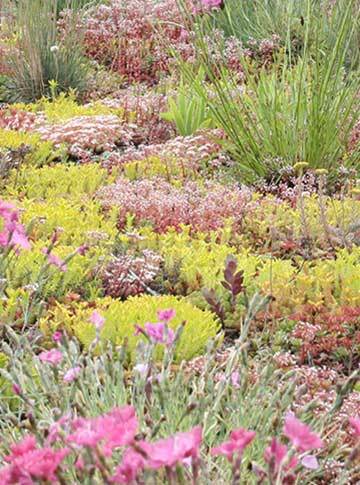 Sedum varieties love the sun and therefore do not do well on roofs with a lot of shade. In this case, a mixture of shade plants is necessary. Shade plants need more substrate than sedum. For this reason, at least 8 cm of substrate is used on shade roofs. This option is only available if the maximum load bearing capacity of a roof exceeds 120kg/m2. On average, a landscape roof is designed with a substrate of 13 cm. This makes it possible to create a real landscape with a wide variety of plants: sedums, grasses, flowers, herbs and small shrubs. This option is only available if the roof has the proper bearing capacity. In terms of vegetation, a roof garden is quite similar to a regular garden, however its creation demands a specific construction. You have to take into account the saturated weight of the roof garden and a variable load of 250kg/m2 for the use of the garden. A permit is required because the garden is used as living space. Do not hesitate to contact us for more information! If you are interested in a green roof, we start by drawing a non-binding quote based on all available information. Subsequently, we will make an appointment to inspect the condition of the roof. If your roofing is in bad condition you can use the services of our sustainable roofers or of one of our partners. We can carry out a construction calculation in case we doubt the bearing capacity of the roof. This way we can be certain that your roof is suitable for the construction of a green roof. For us, the quality of the green roof is paramount and therefore we do not install green roofs under 60kg/m2. A green roof consists of a root resistant waterproof membrane, like EPDM rubber, then a drainage layer, filter fabric, the substrate and finally the chosen vegetation. A roof ages fast due to exposure to heat, light and UV radiation. A green roof is cooler than a black roof and it protects the roof against light and UV radiation. The roof ages less rapidly and the lifespan of the roofing is doubled! The temperature of a black roof can climb as high as 85ºC. A green roof on the other hand, only reaches 35ºC! This has a large effect on the inside temperature of the building. A green roof can cool the space directly below with 5ºC. Consequently, you save energy on air conditioning. Due to a lack of paved surface there is a lot of pressure on the sewage system during heavy rainfall. Green roofs act like a sponge and maintain 60 to 80% more water than a regular roof. It provides a buffer against water overflow in- and outside your house. Vegetation filters particulate matter out of the air and converts CO2 to oxygen. 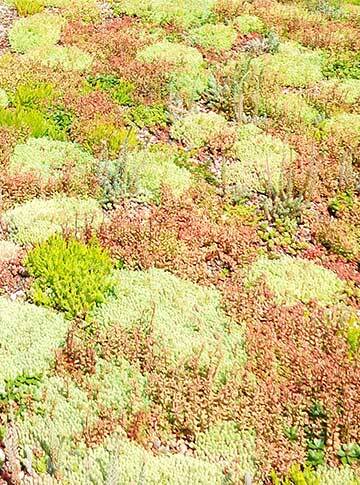 Not much is known yet about extensive sedum roofs concerning this matter. However, research proved that green roofs absorb cadmium, copper, lead and zinc. As a rule, more vegetation equals more impact. Solar panels yield more energy in combination with a green roof. Because of the lower ambient temperature the return increases with 6%. An additional advantage is an increase in biodiversity in the shade of the panels! Flat roofs can make a contribution to food production in the city. Good for the environment and your wallet. A distance reduction between harvest and consumption means less transport costs and fresher fruit and vegetables. Cities consists for a large part of paved, dark surfaces. Because they heat up and radiate this heat, the “Urban Heat Island Effect” occurs. This can result in an up to 5ºC higher temperature than its surroundings. Green roofs can reduce this effect by their cooling effects. Green roofs help the conservation and recovery of endangered animals (birds and bees) and plants. 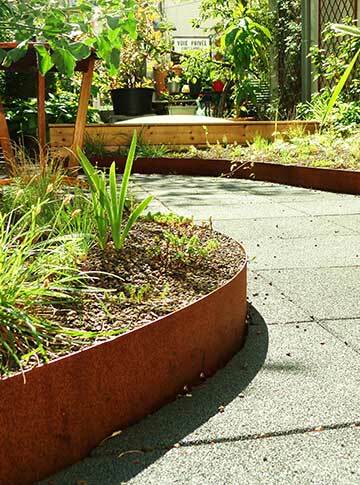 They function as stepping-stones, connecting larger habitats like parks, gardens, abandoned building sites and railway-embankments. Green roofs absorb sound because of their mass. Hard surfaces in urban areas reflect sound instead of absorbing it. Research shows that 10cm of substrate can reduce noise by 5 db. A green roof containing more substrate can result in a larger effect. A green roof is also beneficial to its direct surroundings. It can be a visual improvement to urban and office environments by adding some green. The therapeutic influence of nature can reduce stress, lower blood pressure, release muscle tension, and increase positive feelings. 50% of the costs with a maximum of €30/m2. A minimum of 30 m2 of green roof. The green roof must be able to hold at least 20 liters of water. If the roof is able to hold more than 30 liters of water a compensation of up to €50 per m2 is possible. The roof must be at least 3 years and at least 15m2 in size. €25 per m2 with a maximum of 50% of the construction costs up to €10.000. €25 per m2 of green roof. The catchment areas of the water board “Hollandse Delta” and “Schieland en de Krimpenwaard” compensate €30 per m2. €30 per m2 of green roof. A maximum of 50% of the costs up to €20.000. The same rules apply for a green facade; a maximum of 50% of the total costs up to €20.000. Would you like to have solar panels on your rooftop? Combine them with a green roof! Because green cools down the rooftop it increases the yield of solar panels with 6%. 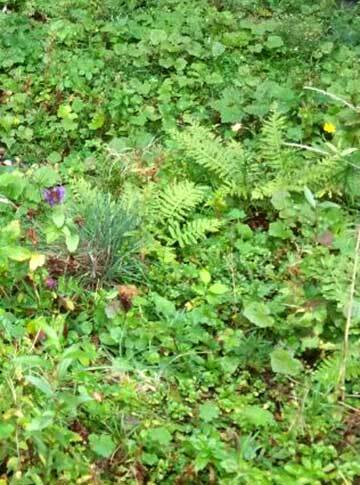 By adding green you also contribute to, among other thins, a higher biodiversity in the city. Win-win! To create this combination of green and solar panels on rooftops we cooperate with Solar Sedum, a company started by a former Dakdokter. A garden on your rooftop, sounds ideal doesn’t it? Unfortunately this isn’t always possible on an existing rooftop (too heavy, too expensive), that’s why Rooffood exists. Rooffood is a product launched together with GrownDownTown and De Dakdokters. It’s a revolutionary en lightweight system of crates that are easily put together by a click-system. This way the system is easily put together and just as easily removed. The integrated irrigation system guarantees a successful harvest. The ‘inserts’ – crates filled with substrate and precultured vegetables – can be effortlessly placed into the subsystem. It offers customers the possibility of harvesting fresh greens off their own roof on a regular basis.